New Delhi, Tuesday, July 08, 2014: A statue of Mahatma Gandhi would be installed by early next year in Parliament Square in Britain, the country he took on for India’s freedom. British Foreign Minister William Hague and Chancellor of Exchequer George Osborne, who are on a visit to India, announced on Tuesday that Mahatma Gandhi’s statue will be installed by early 2015. A statue of Mahatma Gandhi will be erected opposite the Houses of Parliament, Cabinet ministers have announced. Gandhi, who studied in London, will join Winston Churchill, Nelson Mandela and Abraham Lincoln when a statue is unveiled in Parliament Square early next year. Interestingly, Churchill was one of the biggest critics of Gandhi and once described him ‘half-necked faqeer’. Gandhi at that time was leading a non-violent mass movement in India against the British Raj. It will be in place in time for the centenary of Gandhi’s return to India to begin the non-violent struggle for self rule, as well as the 70th anniversary of his death in 2018 and the 150th anniversary of his birth in 2019. Mr Osborne said: “As the father of the largest democracy in the world, it’s time for Gandhi to take his place in front of the mother of Parliaments. He is a figure of inspiration, not just in Britain and India, but around the world. The announcement was made as the ministers visited the Gandhi Memorial in Delhi on the second day of a visit to India. Philip Jackson, the British sculptor who created the RAF Bomber Command memorial statues in Green Park, has been approached. Ministers hope the costs will be met through charitable donations and sponsors. 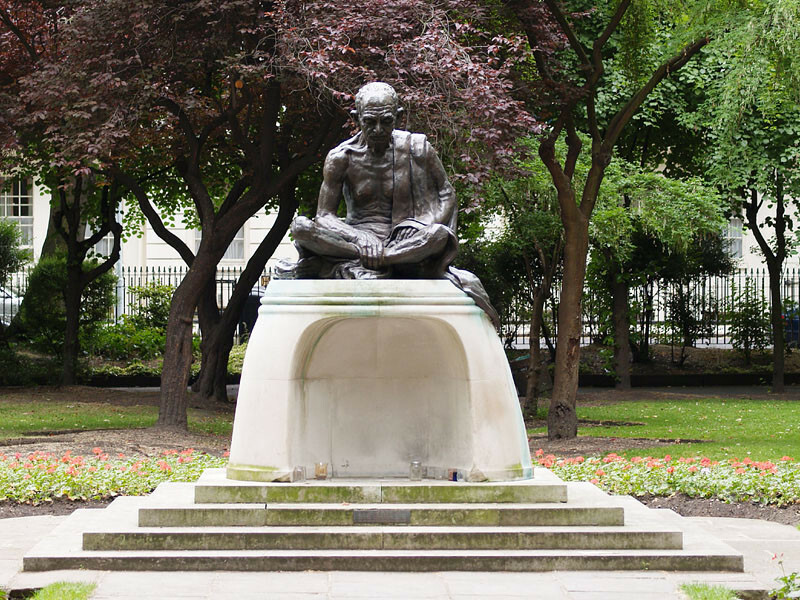 London already has a Gandhi statue in Tavistock Square, one of the most beautiful squares right in the heart of central London.